eXert MCS [Maintenance Control System] is used to Plan and schedule preventative maintenance and Manage work orders efficiently. eXert MCS manages client’s job orders in order to process a functional and financially assigned task. eXert MCS Satisfies customer demand, reduces managerial control and Improves trust and collaboration. eXert MCS works for multiple sectors like residential, Projects, Vehicles, Equipment, Machinery, industrial, environmental etc. eXert MCS Plans and deals with maintenance related work to customers of organization. In order to achieve this task, eXert MCS integrates with Customer Relational Management, Financial Accounting System and Inventory Management. eXert MCS provides balance sheets and profit & loss details. eXert MCS maintains Inventory Management and provides accurate information on item stock balance, stock issues, stock returns, Stock transfer between branches etc. eXert MCS provides solutions to purchase if stock not available and assign materials from warehouse. 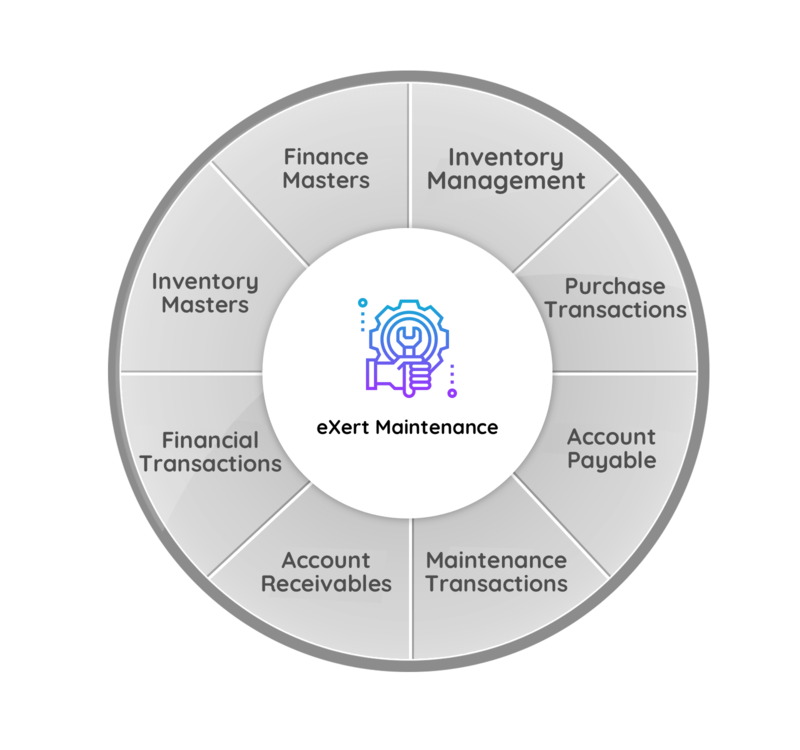 eXert MCS Provides maintenance details like Job Orders, Material Request, Material Approvals, Material Issue, Customer Invoice and also Inventory details like maintaining stock, stock transfer between branches, Purchase Order to vendors, purchase invoice, payment against invoice etc. EXert MCS maintains financial reports of customer, supplier and also maintain Inventory Stock. It gives accurate reports on outstanding statements, account statements, profit & loss etc. Plan and schedule preventative maintenance. eXert MCS Provides high value experience with multiple user and roles. Obtains high quality online training and support at different locations.